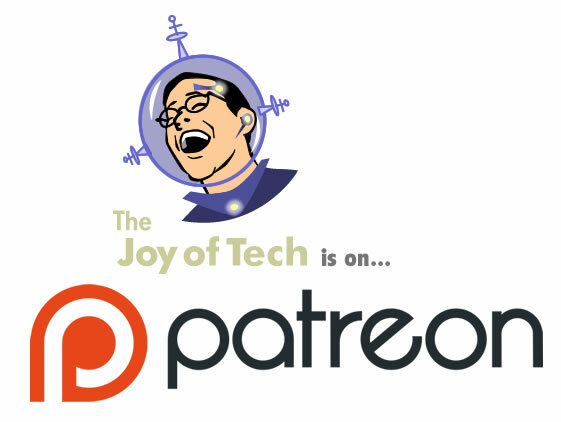 Help keep the Joy of Tech! We're on Patreon in order to continue or comic work, and it's really helped so far. Please click on over there to find out how you can get fun stuff and keep the comic going! Let's hope Patreon keeps their fees low to support all artists. If you're looking for the old SuperFan system, where you don't have to sign up to Patreon, and wish to donate via it, you can find that here! If you have any suggestions and questions, please let us know what we can do, and we'll try to accommodate. Donating directly via PayPal: This is our preferred method. It's better for most donations or webstore purchases as we tend to get a larger percentage of the funds. If you don't have a PayPal account, you can still use a credit card, just look for the link to pay via credit card without a PayPal account. Donate via our webstore set-up: You can donate via our webstore system, using the provided link below. You can pay via cheque, money order, or credit card, with or without a PayPay account. If you'd like, you can top up your donation... Ya sure, top it up by 5 bucks! Treat yourself to Tim Hortons, here's another 10 bucks! Dinner's on me, I'm topping it up by 20 bucks! Spoil yourself folks, I'm topping it up by 50 bucks! Hold on to your beanies, here's a hundred more smackaroos! I'm an angel, here's 1000 more bucks. Now take a week off!